There are few things I love more than pizza and I love to experiment and come up with new topping combos. I’d guess we have pizza about once every ten days. And while we never tire of it, we do get burnt out on buying it. 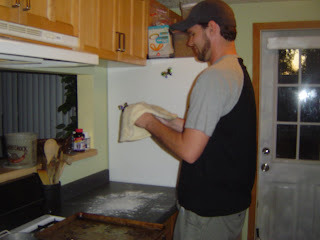 Once I discovered that out local grocery store sells fresh dough, it was on! Especially since I don’t have what I consider the proper amount of space, or tools, in my current kitchen to tackle making my own. Let’s face it… I don’t really have the patience for “letting things rise” either. I’ve made many pizzas over the last few months hoping to share them with you. Unfortunately pizza is kind of a hard thing to photograph, but I was happy enough with these shots to share them with you. 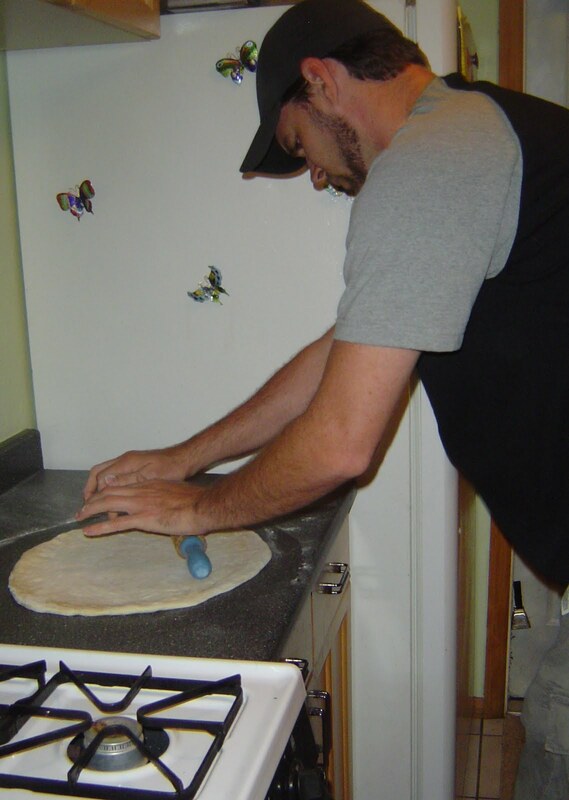 Brent is always in charge of forming the crust when we make pizza. I’ve tried to figure it out, but he has experience doing it at a restaurant, so now I just delegate the job to him. 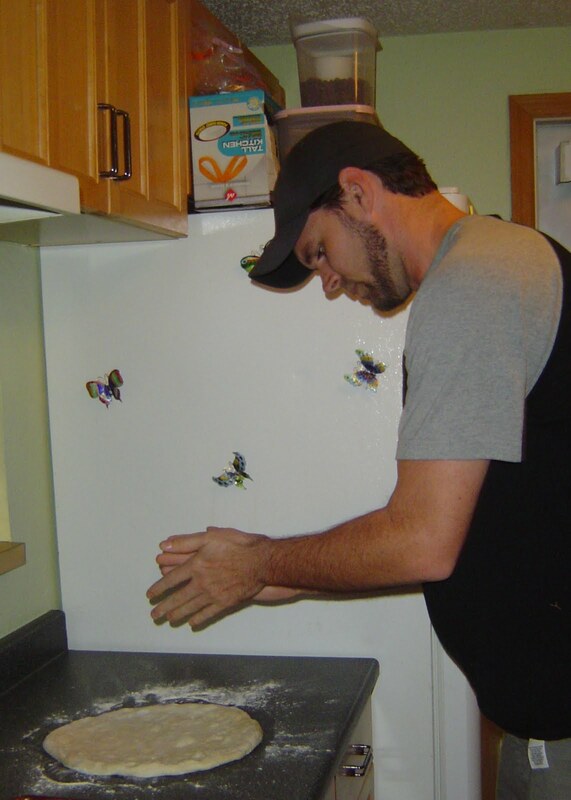 After I clean the countertops off thoroughly and threaten the cats with water torture treatment if they come anywhere NEAR it, Brent gets to work rolling, flipping, throwing flour all around, and stretching the dough out to the perfect shape. Normally I have all the toppings set up to go as soon as he is done. For this pizza I did a Shrimp and Andouille Sausage pizza complete with two kinds of cheese, peppers and onions and a slightly spicy sauce. Prepping the ingredients is very easy, just be sure you slice the veggies as thin as possible – a mandolin is great for this! I cube the andouille up to be about the same size as the shrimp after I clean it, remove the shell and cut it into thirds. I’m slightly obsessive about toppings being the same size. It's weird, I know. Next it’s just time to shred some cheese and mix together the sauce. I went simple with tomato sauce with some added herbs, but you can just use your favorite brand! Pop it into a piping hot oven and in less than 15 minutes, it’s ready! I would have loved to use green peppers for some color, but Brent hates them so we went with yellow. Use whatever color you prefer. I think what surprised me most about this pizza was how the andouille gave it a lot of flavor throughout, but didn't overpower the other ingredients. The veggies were cooked just right with out being mushy or undercooked, and the shrimp was tender. I’ll definitely make this one again. 1. Preheat oven to 500 degrees. Start by mixing the garlic powder, onion powder, chili powder, and red pepper flake with the tomato sauce. Season with salt and pepper and simmer for 10 minutes over low heat. 2. Meanwhile prep your toppings by shredding the cheese, slicing the vegetables very thin, cubing the sausage and cleaning the shrimp, removing the shells, and cutting into thirds. 3. Roll out your dough into any shape you prefer. Use plenty of flour to prevent sticking to the pin/counter. Once you reach your desired shape and thickness, transfer to baking sheet. 4. Spread an even amount of sauce over dough, leaving about an inch border along the edge. (You may not need the full amount. Sauce to your liking but be careful not to over sauce.) Next cover pizza with both cheeses, followed by veggies, shrimp, and andouille. 5. Bake for 12- 14 minutes or until cheese is bubbly and bottom crust is lightly browned. 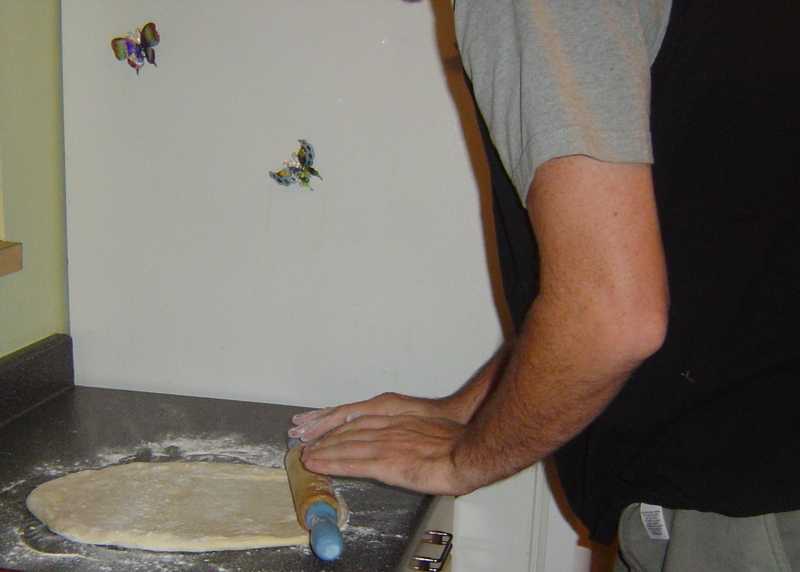 The time will vary based on your dough’s thickness. 6. While pizza in baking, melt butter in a small dish. Once melted add parmesan and stir to incorporate. 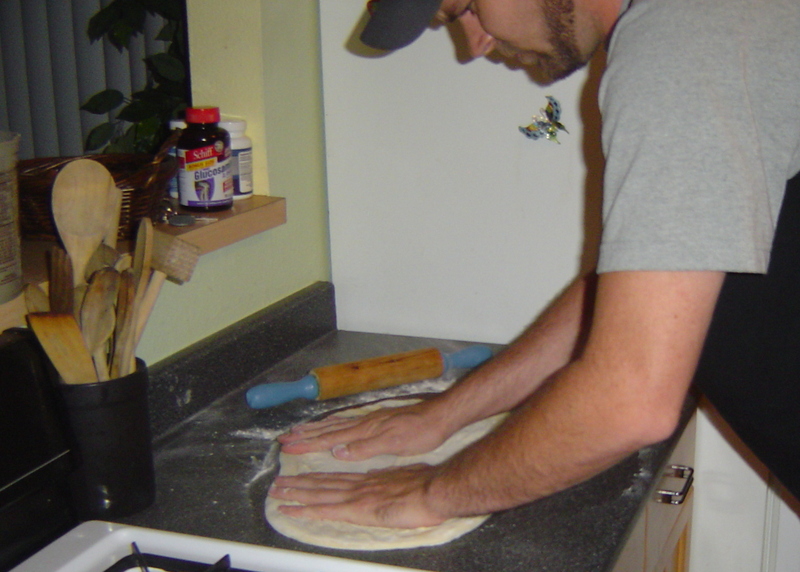 Brush over pizza crust once pizza is removed from the oven. 7. Let pizza sit for a few minutes, then slice and serve. 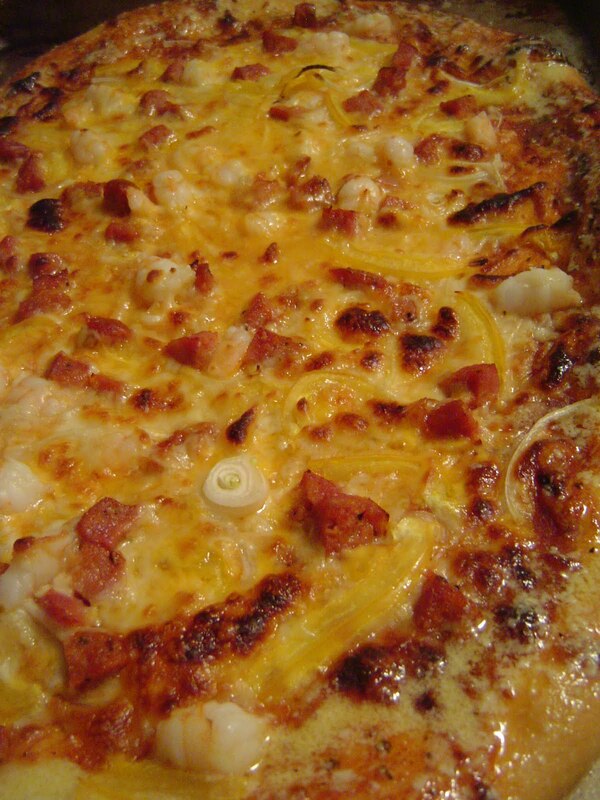 Shrimp meat makes the cajun-style pizza taste fuller. As somebody that not only makes pizza in his kitchen every week, but also has very little space in it, let me tell you -- you don't need anything more than a bowl to make dough, and you do NOT have to let it rise. Making dough is simple, you really should try making it yourself...the dough can make a huge difference! !